Liquid Rhythm lets you create intricate, interesting beats with unprecedented speed and precision. 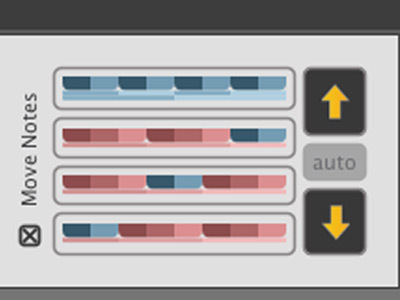 It’s the first sequencer that lets you make beats using note clusters and patterns instead of individual notes. And it completely streamlines your workflow. Get started using the built-in sample library, trigger your virtual instruments, and experiment with new rhythmic patterns. Whether you use a Mac or PC, Ableton Live or other DAWs, Liquid Rhythm will help you realize your music’s full potential. Liquid Rhythm gives you unprecedented control over your sounds. 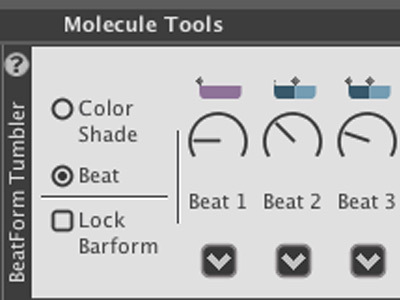 You can fine-tune your beats with a host of razor-precise editing tools, and mod your beats using powerful MIDI effects. The ability to alter every part of a beat was thought to be a legend—a myth born in the deepest jungles of untamed lands. We sent people in. They came out with BeatForm Tumbler. BeatForm Tumbler lets you isolate any region of your beat and turn up the complexity with a simple turn of a knob. Looking to simplify a beat? It’s just as easy. 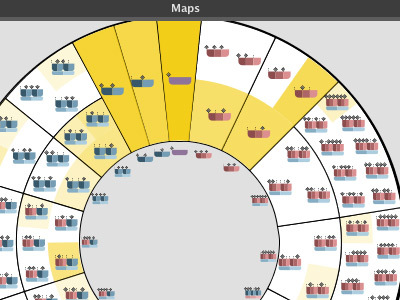 Simply click on the region you would like to change and turn the knob to cycle through an array of note clusters to find the one that best suits the music. Beat block—that mortifying moment where you can’t seem to come up with any new beats. It’s ugly. And it’s all too real. If you want to avoid it, you need BeatWeaver in your life. 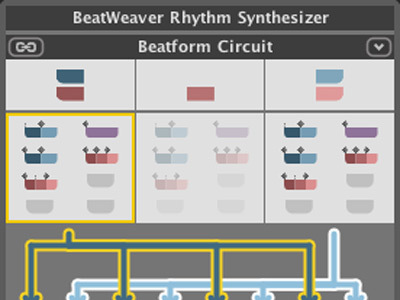 Select a series of beat forms and drag them into the BeatForm Circuit. From there, the beat forms are automatically sent through the BeatForm Step Sequencer and into the BeatWeave List—a table that shows every possible combination of your selected beat forms. Choose your favorite beat from the list and drag it into Arranger, and you’re done. It’s an intuitive way to get the creative juices flowing again and discover new and unique beats you may have never thought of. BeatSeeker is the perfect tool for exploring new instruments and navigating the infinite rhythm options in BeatWeaver. BeatSeeker automatically looks at every possible beat and highlights the most commonly occurring patterns for whatever instrument you’re working with. Not sure what to do with the hi-hat? Click on a region in the hi-hat track and BeatSeeker will highlight the most frequently used patterns—the darker the highlight color, the more frequently it’s used. BeatSeeker automatically runs uber-intelligent algorithms to help you find just the right groove—let’s just hope it doesn’t overthrow the human race one day. Unlike some digital maps, this one won’t have you making any right turns off the Golden Gate Bridge—it’ll turn you onto the exact beat you’ve been looking for in seconds. 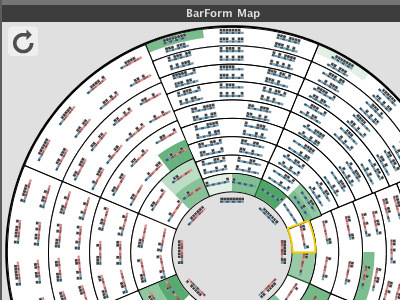 The BarForm and BeatForm maps display every combination of rhythmic patterns possible in a 4/4 bar in organized wheel charts. Whether you’re looking for a simple four-on-the-floor kick drum beat or a complex frenzy of instruments, its all on the map wheels—simple beats are organized near the center of the wheel, with the beats becoming more complex as you move out toward the edge. Once you find the beat that best suits the song, simply drag it into the Arranger and keep writing. Modern music is all about remixes. So why wait for someone else to do it when GrooveMover lets you do it instantly? In the arranger, select the regions of the beat you want to remix and press the GrooveMover arrows up or down to alter the arrangement of the notes in the bar. Use it as a songwriting tool to discover variations of your favorite beats, or as a way to give your newest single a second life. For all those brainstorming sessions at the beginning of a new project, there’s Randomizer. Quickly dial in what you’re looking for on the Barform, Beatform, Collaborate, and Velocity & Groove sliders to point the Randomizer in the right direction: do you want a simple or complex beat? Should the notes have different accents? Then hit “Surprise Me!” and see what the Randomizer comes up with. 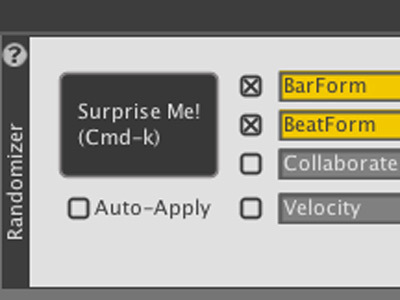 As with all Liquid Rhythm tools, playing around with the Randomizer may lead to some unimaginable beats, so have fun with it! 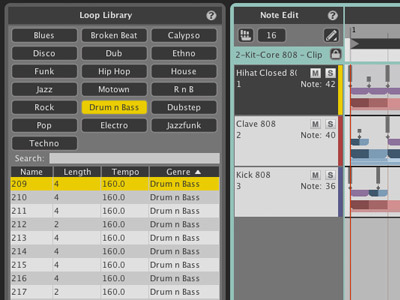 Built to accommodate any musician, the Loop Library contains an array of MIDI loops that are organized by genre. From Dubstep to Blues, Motown to Trap and beyond, the Loop Library brings intricate and unique beats to any project. Drag and drop or double click on the beat to load it into the Arranger and start down the path of your new project. Years of research and development went into creating a modern musical language that synthesizes MIDI and traditional notation—we call it the Music Molecule. It’s a showcase of shapes and colors that helps you visualize the rhythmic structures of music. These structures provide a way to group notes together into little note clusters that you can play with—they can be sequenced, edited and painted. WaveDNA is a Toronto-based developer of professional MIDI software. Liquid Music and Liquid Rhythm, two applications acknowledged worldwide for the intuitive, creative harmony rhythm, and melodic perspective they provide to music makers across the globe.